Springfield Armory officially introduced its new XD-E pistol at the 2017 NRA Annual Meeting in Atlanta, Georgia. They were nice enough to give me one to review and I want to give you my opinions and evaluations after testing it. 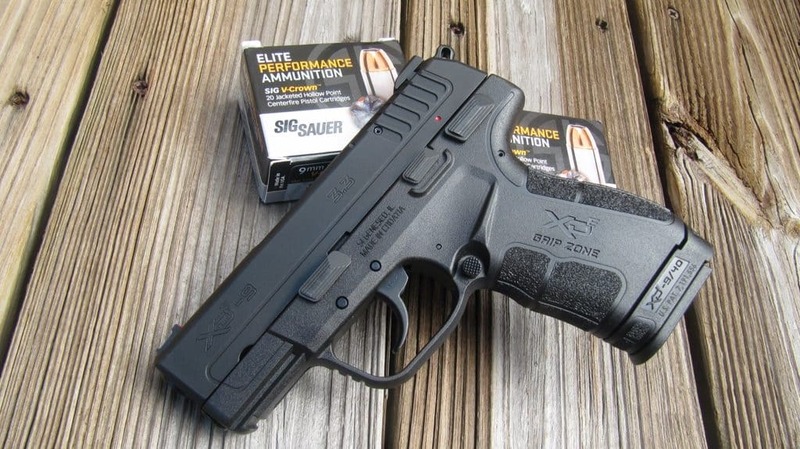 The Springfield Armory XD-E is a slim-framed 9mm pistol with a Double-Single Action (DA-SA) trigger that features a manual external safety-decocker combined and an external hammer. Yes, that is correct… an external hammer, an external safety and decocker, and not striker-fired, not single action, and not double action, but DA-SA. What does the “E” stand for in the model’s name? It stands for “External” Hammer. A big clue as to what this gun is about. It will appeal to a certain portion of the market that like a long and hard double action first press for safety reasons and to those who like a small sub-compact gun with a 3.3″ barrel to carry concealed. To me the XDE looks very close to their XD-S striker-fired gun. What are the features of this new gun and what makes it unique? Is it really different from other handguns? If so, how? Why did they choose to introduce a new pistol with an external hammer? Keep in mind that any gun with an exposed hammer, rounded or not, has the potential to snag on the draw. Why did they choose to combine a thumb safety and a decocker in one lever? Is the recoil spring lighter than others and why? 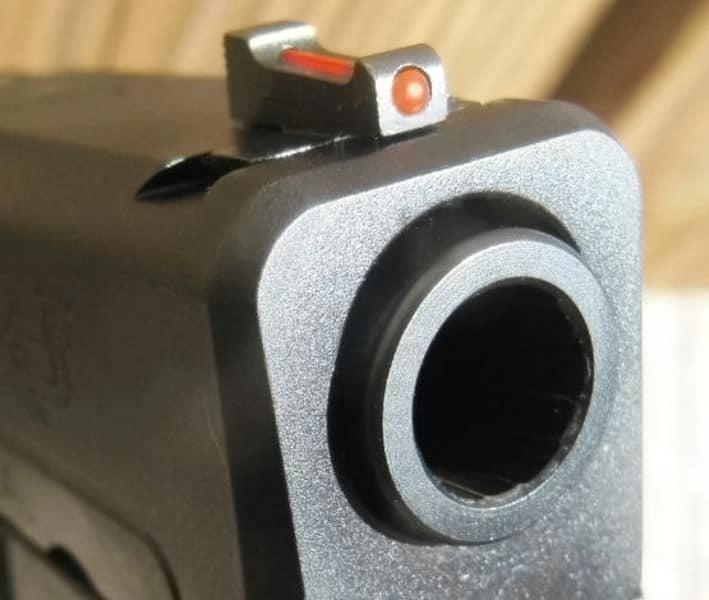 A common complaint I hear regularly is “why is this pistol so hard to rack?” Well, SA heard that as well and they are saying that “the slide on the XD-E requires 27% less effort to rack” compared to other semi-automatic pistols, e.g. striker-fired, DAO, and SAO. They call it a Low-Effort Slide (LES.) They use a lighter recoil spring in their hammer-fired gun to help with slide racking. So, I began my exploration to learn and try the new features myself, test and understand the pros and cons of this new pistol, and compare them against my criteria for selecting a handgun. Below are my criteria that I considered when I examined, analyzed, shot, and reviewed the XD-E. I was considering the XD-E primarily for concealed carry, so I wanted to closely evaluate its features, concealability, and handling for concealed carry. Would this be in my top 3 concealed carry pistols for regular carry? My criteria that follow are the physical gun attributes, features, and characteristics I want for my specific purposes for the gun. I will use my 10 criteria for evaluating the handgun for my primary concealed carry purpose. Of course, some criteria standards are defined differently and some not used for different uses of the handgun, e.g. carry versus competition. There are other less tangible, subjective features that may be appealing for some, like appearance, individual felt recoil, included extras like a third magazine, holster and mag pouch, ease of takedown, lockable case, customer service, action/trigger preference, etc. So, I combined these into the last Miscellaneous criterion. I assigned a total possible point score of 10 points for each of my 10 criteria for a total possible score of 100 points. You can certainly add your own additional criteria or desires and subtract any of mine. Remember, there are a lot of characteristics, attributes, pros and cons, and criteria to include and consider and you make your own tradeoffs according to your priorities, preferences, and defined needs and use. Why the Hammer-Fired DA-SA XD-E Pistol for Concealed Carry? There are a lot of striker-fired concealed carry single stack (thin), polymer (lightweight) handguns in the market now. Probably for some good reasons. There are few hammer-fired DA-SA trigger, single stack, polymer pistols. As most know, a DA-SA trigger has a long and hard trigger press for the first shot, followed by short and soft subsequent trigger presses. The first DA press or poundage required to pull the trigger back until it “breaks” and releases the hammer can be upwards of 10 to close to 16 pounds or more. Another consideration for the DA-SA gun is that the trigger press of the first shot is different than the subsequent single-action shots, which can affect accuracy on the critical first few shots in emergencies. Understand that there is no absolutely correct or “right” trigger press. It depends on your use of the gun, your shooting skill and muscle memory development and experiences, proper and frequent practicing, and your preferences primarily. Competitive shooters might have a trigger as light as 2-3 pounds, while law enforcement officers in New York City might be required to have a 12-pound (NY Plus) trigger. Why would anyone want to have a heavy trigger press you ask? Well, they may be required to because of the nature of their duties, for added safety reasons, for inexperienced shooters who do not practice regularly and need the safety crutch, or for those who have not been trained properly in the gun actions and features. There is not one single answer and “it depends.” But remember, your mind and brain are the best safeties you can have on any gun. Why would anyone want to have a light trigger press (say 4 to 5 pounds) for their pistol you ask? Again, it depends on duties, safety, experience, training, and skills, etc. If your pistol weighs 36 ounces (plus about 3 ounces more for ammo) and your gun has a heavy, DA-SA trigger of 12 pounds, you must apply 12 pounds of pressure while trying to hold your 2.50 pound gun steady and still, so you can make a decent target hit. It is difficult to keep your sights focused and hits in the bullseye, when applying that extra force on the trigger. It’s about minimizing (not eliminating) as much movement as you can and its relationship to accuracy. Saying that “training and practice play a major role” in this is an understatement! Over hundreds of classes and many students and for myself, I have found that a lighter trigger improves most shooters ability to hold the gun steady with less movement while firing their gun, which directly affects ACCURACY. Whether you are a competitive shooter, shooting in self defense, or plinking for fun at the range, your goal is ACCURACY. You can be more accurate by minimizing and controlling movement. And the trigger press is a major part of that challenge. Most folks, especially new shooters, move more when shooting a DA-SA handgun because of the harder press and the difficult transition between a hard and long press to a soft and short press. This can be true of experienced shooters and new shooters. And, as the respected 3-3-3 Rule says, most deadly-force encounters on the street or in the home involve an average of 3 shots being fired and it’s over. So, we are not usually attacking terrorists nor confronted by a group of 3-4 armed attackers. I want my first shot to be on target! 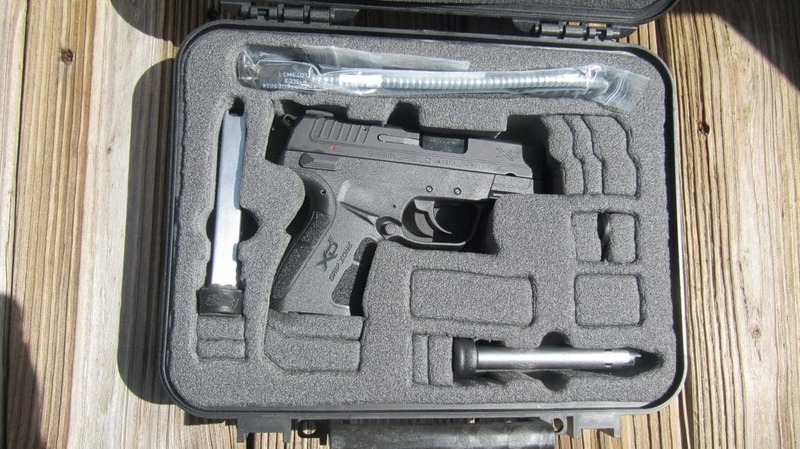 But when carrying the XD-E, you can rack the slide to chamber a round and then put the external safety on and carry the gun in single action mode for a soft and short press later. When you draw and fire it in an encounter, you will have a short and soft press in single action mode for the shot, as well as for all subsequent shots. Do I want to carry a DA-SA gun? What are my personal reasons? There is no wrong answer, so justify it for yourself. My criteria for MYSELF for a concealed carry and home defense pistol is that a pistol should have a trigger no lighter than 4 pounds and preferably no more than 6 pounds or close. I have found over my 46 years of teaching that new, average shooters will in general shoot a pistol with the same trigger press from shot to shot better than a DA-SA pistol that has a long and heavy first trigger press, followed by a shorter and lighter trigger press for each shot that follows. For example, an M&P 9C, a Ruger SR9C, a Springfield XDM, and a Glock 19 all have a factory stock trigger that is about 5.5 pounds and is the same for each shot, compared to a Beretta M9/92 DA-SA with a double action first trigger press of about 13 pounds and a 5 pound single action press for each shot that follows. I own the DA-SA 92, Sig Sauer 226 and 220, H&K P30, CZ 75B, etc. All excellent guns and I appreciate them. Now, I am not saying that a DA-SA trigger cannot be mastered because it can with much practice vis-a-vis a striker-fired gun. Another consideration is that if your pistol weighs 2 pounds loaded and you have an 8 pound trigger press, it will take 4 times the loaded weight of the gun to make it fire. So for the average shooter it is almost impossible to shoot the gun accurately under stress. This results in misses and endangers nearby innocents. So the long and hard trigger press that was sincerely meant to be a safety factor ends up increasing the dangers. This is sometimes practiced by law enforcement agencies issuing revolvers with their heavy triggers, with their thought that the long, heavy double action trigger press serves as a safety device. Some folks then relax and the unsafe habit of placing the finger on the trigger when it should not be there emerges. So for ALL guns, we should train and retrain in the safety rules, especially keeping our trigger finger off the trigger unless we have our eyes and sights on the target and we are ready to shoot. It is sad for me to report, but every single class I have taught over the years, there has always been at least one person in each class who violated this critical safety rule of keeping their finger off the trigger. Thankfully, not one single person was injured and these rule violations occurred almost always in the classroom with inert dummy guns. So attention to safety rules, trigger-action types, press weight, familiarity with your particular gun, and proper training deserve much consideration for all shooters betting their life on their gun. There is a continuous debate over whether the striker-fired gun has advantages over the hammer-fired gun and vice versa. One thing to keep in mind is that most striker-fired guns have passive safeties, so no extra steps or fine motor skills are usually necessary. Some believe a simple gun design without external safeties removes many points of failure for shooting a gun in a critical situation. Some believe that they are inherently unsafe. Again, it depends on the shooter. Others believe that you can train to operate any gun safely and effectively, even in stressful encounters. Both points of view have their strong considerations and it is very personal. See my article on this website about striker-fired versus hammer-fired handguns, posted on December 21, 2016. After shooting and handling the new XD-E 9mm and carefully considering its specifications, below is what I learned and my point evaluations for each criterion. 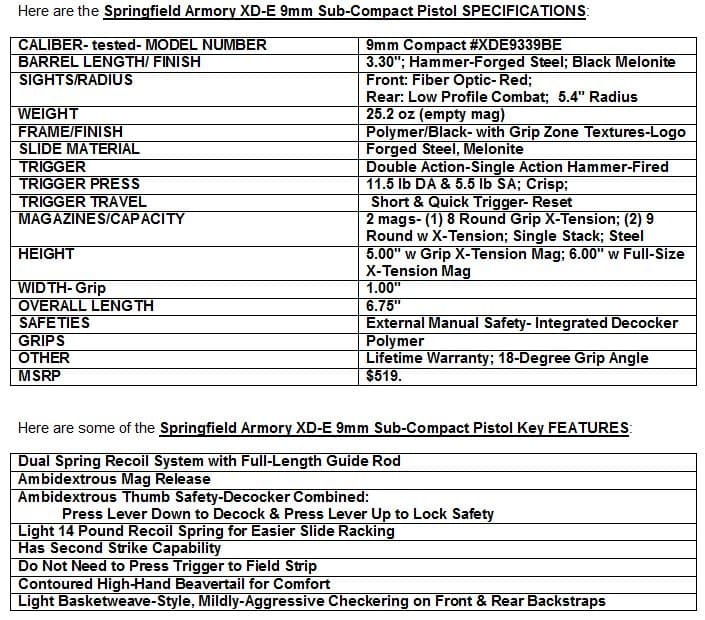 You should know that Springfield Armory is not paying me to say these things, I am not on Springfield’s payroll and do not feel obligated to say the things that follow. I want to give my honest opinions and my rational relative to my criteria and use. I did have 4 of my students shoot the XD-E and give me their input. Also, recognize that I am not a top expert shooter by any means and I only shot about 200 rounds through the new XD-E, so it really is not fully broken in. The XD-E felt real good in my hand as far as the grip zone area. But, especially for my first long and hard shot in double action from the draw, I found my medium-sized trigger finger had difficulty with the trigger. My trigger finger’s distal interphalangeal joint (end joint of our fingers) did not completely reach the trigger and there was a narrow amount of space in the trigger guard for my finger to fit; it was crowded space there and my trigger finger touched the guard. This influenced my first shot, the nine-ring hit in the target above. I guess my lack of practice with a DA-SA gun was a factor. My group was 3+ inches, not my usual 2-2.5 inches. Not the best, but OK. I tried to be uniform in my drills and approach, but did have trouble. I finally got use to pushing the combined safety-decocker down for the decocker and up for the safety. No problem. I did, however, miss the grip safety I am accustomed to on my other Springfields. No grip safety for the XD-E. Some like that and some do not. Your personal call. I want to report that I did not have ANY malfunctions or stoppages at all. The trigger was smooth and crisp for all shots, but long and hard on the first DA shot. The XD-E is made very well. The slide-to-frame fit was very tight and solid. There were no failures to fire or failures to feed or eject; no failures to lockback; and no misfires. The gun digested the various ammo used well. As I said before, I am not use to regularly shooting a DA-SA gun, so this was not that enjoyable for me. But I do want to emphasize that the XD-E had very manageable light recoil and the 1 inch grip width felt great in my hands. Here are my specific opinions about each of my 10 criteria. The Accuracy of the XD-E for carry purposes was acceptable for me at distances of 7, 10, and 15 yards, but not the best at 20 yards. Please understand that my personal preferences and the majority of my shooting time is with single-action and striker-fired guns… this is a contributing factor. Me not the gun. I was able to shoot somewhat decent groups up close, even with its higher bore axis, with the gun doing most of the work. Not my usual 2.5 inch groups, but acceptable for personal protection.My groups at close distances of 5 and 7 yards were acceptable once I got use to the DA-SA action and controlled my movement for the long and hard double action press. I used my Modified-Isosceles Stance, a two-handed grip, and shot various premium 115 grain, 124 grain, and 135 grain JHP and FMJ rounds. NOTE MY OPINION: I believe striker-fired guns have an advantage for a carry gun because of the same, consistent lighter trigger press each time. An advantage in critical defensive situations. Quicker follow-up shots are possible because of the usually lower bore axis, consistent press, and simple design. Their safeties are usually passive, so no extra steps with certain fine motor skills involved.They are simpler to shoot, especially for new or less experienced shooters, and easier to conceal without hammers. The Trigger Press out of the box averaged about 11.5 pounds for the first DA shot and 5.25 pounds for subsequent shots, with 10 readings with my Lyman Electronic Trigger Pull Gauge. Since it is a new pistol with no break-in period, it probably will improve. But the first press did not meet my criterion and my expectations. I believe with more rounds down range and my additional experience with DA-SA guns, I will make more of a contribution and do my part for a better press result, but still the first long and hard press is not for me for carry purposes. Subsequent presses were certainly acceptable. Because trigger control is important in high-stress carry situations, manufacturers (like Springfield & others) are adding lighter, crisper triggers and striker-fired guns. Springfield has some nice striker-fired guns. Some ladies in my classes had trouble reaching for the trigger on the XD-E. The XD-E Trigger had a somewhat short travel distance with a crisp, identifiable reset point. I did have to concentrate and work for quick follow-up shots. But, the reset was definite and identifiable. I found the very curved trigger in DA to be uncomfortable and did not like the smaller, confined space of the trigger guard on the first DA shots. The DA was not acceptable to me, but the SA was very good, smooth, crisp, & consistent shooting with close to the same press each time. I did not like the transition between the two actions. The finger reach to get to the trigger was long, causing problems for those with short fingers, e.g. my wife and mostly female students. 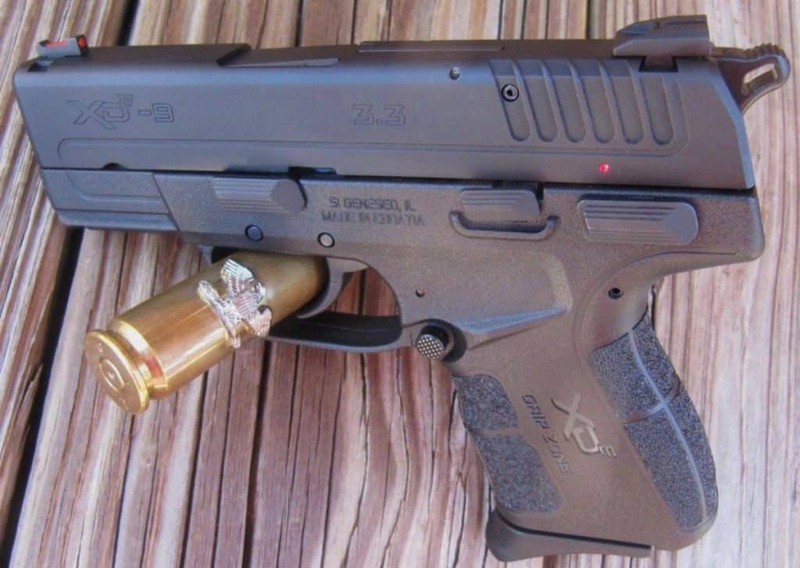 The XD-E’s 3.3-inch Barrel was nice for concealed carry. I was surprised that I felt very little recoil with it and it was very manageable and decently controllable. I did not notice much muzzle flip (some due to the little higher bore axis) and the sight radius was not a distraction. The Fiber Optic Front Sight and the red-color really helped me to quickly get my sight alignment and sight picture. I prefer the Fiber Optic Front Sight and it helped me to quickly find the front sight. Extra Red and Green Rods were included. 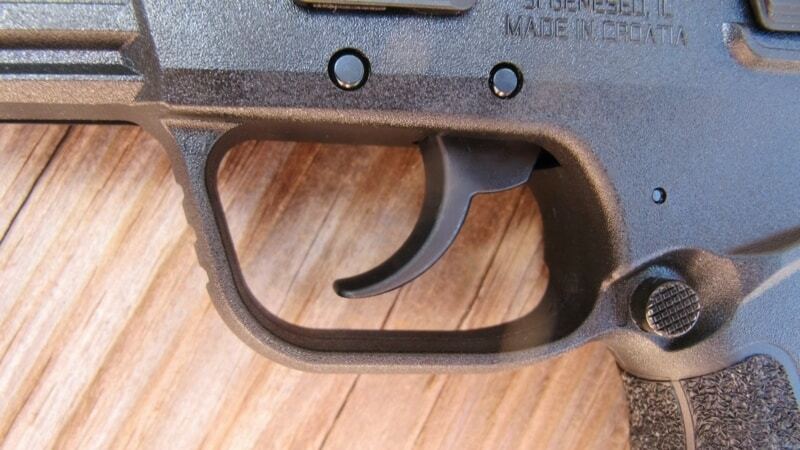 The low profile rear sights were very helpful for carry. The Sights are very sturdy. It was easier for me to see the green fiber optic front sight, since I am red color blind. The lightweight polymer frame combined with the stainless steel barrel for a nice 25.2-ounce unloaded mag Total Weight. The XD-E was not too heavy and there was very little felt recoil, manageable for me. Great weight for carry. It was just right and I could handle it well and accurately for a compact. The 9mm Caliber for this XD-E was very enjoyable to shoot and made recoil very manageable. I prefer the 9mm for concealed carry, since I practice a lot with it and am usually accurate with it. However, not as well as usual with this DA-SA and the long and hard presses. It easily digested a variety of 115, 124, and 135 grain 9mm ammo. I like the 9+1 Capacity of the XD-E with the X-Tension, but it was not the best for carry. The 8-round Grip X-Tension and the 9mm single stack steel mag was fine for carry. It would be nice to have included 3 total steel magazines for CC. The mags have witness holes to help keep up with the number of rounds. I wanted the 10-round capacity, but understand the trade-off with this model and size for carry. The ergonomics of the XD-E were fine for my medium-sized hands. All my fingers could fit on the mags and I could easily reach all the controls like the thumb safety, slide lever, and magazine release, without turning the gun or adjusting my grip. My wife had to turn the gun in her hand, but she has small hands and fingers. It was comfortable in my hands and its thin sleek design fit them just right and were good for carry. It was very comfortable to carry for my limited week carrying it. I disassembled and re-assembled and cleaned the XD-E before I shot it. It has a dual spring recoil system, with a full-length guide rod. It was very easy to takedown and reassemble. The mags had witness holes which was very handy. Wish there was a third mag included, like with some of the other Springfield guns. There was a flat basepad included in the case for CC. But, there were NO holster and pouch included. For ME, the XD-E is a borderline recommend for my carry purpose, with its DA-SA long and hard action and first press and inconsistent press when transitioning from double to single action. Also, the smaller trigger guard for my medium-sized fingers and the extremely curved trigger were not comfortable for me. This is a quality-built and very nice gun, but not for me and in my opinion not for concealed carry, given the many DAO, striker-fired, and single-action options available now. My Springfield XD-S is a similar and nice alternative to consider; it is striker-fired. It has a small, concealable profile, steel slide and barrel, fiber optic front sight, and single stack design, and comes in 3″ and 4″ barrels. For ME, this striker-fired XD-S is a better option for carry purposes. To be fair, I do want to shoot more rounds through the XD-E to see if my initial evaluation still holds. Since I defend my life and the lives of my loved ones, I have high expectations for my concealed carry guns and I do not feel comfortable and confident carrying this gun FOR ME. But, you must shoot this or any gun to decide for yourself with your criteria and use in mind, no matter what anybody else believes and for your desired purpose. 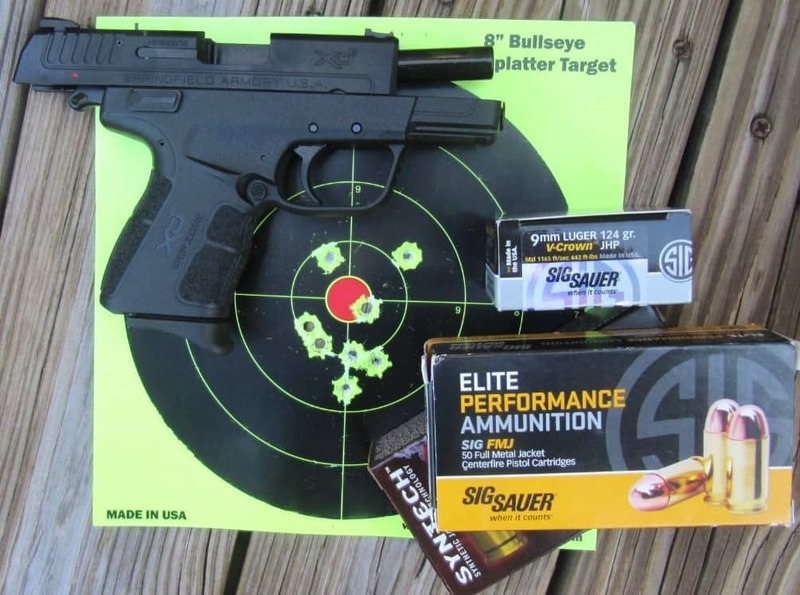 I hope my review of the XD-E 9mm has introduced you to this handgun and is a start for your own testing and evaluation. Consider that this is just my point of view with limited live-range fire and using only 200 rounds of certain ammo, albeit premium ammo. Like always, I recommend that you shoot any handgun yourself before you purchase it. Decide on your criteria, how you will primarily use the gun, and what’s important to you ahead of your range live fire. Then critically evaluate the gun yourself with your criteria, priorities, and purpose, using standard drills (several mentioned in my recent BOOK “Concealed Carry and Handgun Essentials”), with various ammo types and brands, over an extended break-in period of about 500 rounds. SUCCESS! Photos by Author and Springfield-Armory. Previous articleAnother Good-Guy with a Gun in Illinois!